Will Airlines Take a Gamble on Atlantic City? In many ways, Las Vegas and Atlantic City will always be inextricably linked as America’s original gambling meccas. The former was practically founded 1940s by a gangster, made mythic by Frank, Dino and Sammy in the '50s and '60s, and today waffles between its "Sin City" monikor and a family destination while luring millions. The latter’s history is even more exotic, as accurately portrayed on HBO’s "Boardwalk Empire" from its Prohibition-era decadence, to its Steel Pier and Boardwalk, its famed beach, on through the legalization of gambling in the 1970s, and yet another place that Sinatra helped build. But where Vegas survived the economic downturn of a few years ago and has little gambling competition on the west coast, AC was hit hard by the double whammy of the recession and a burgeoning market in the northeast for casino resorts. Now Atlantic City is hoping the airlines will help revive the city. The Casino Reinvestment Development Authority this week voted to devote $5 million to a risk-abatement program that will allow airlines to compete for grant funding, according to the Press of Atlantic City. The paper noted that the CRDA is not bound by guidelines that dictate how, and how much, subsidies can be used, like the Federal Aviation Administration. The funding will reduce the risk an airline would assume in adding routes to Atlantic City, the paper noted, as the authority would agree to “buy” a certain number of unfilled seats on each flight for a certain period of time. In the most simplistic explanation, Atlantic City needs people. Desperately. And airlines bring people. 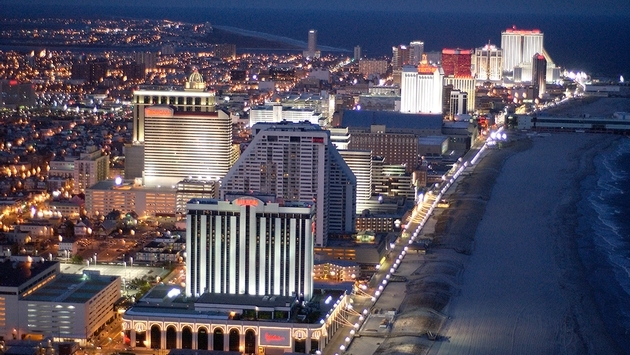 Atlantic City was always a more regional destination than Las Vegas, and the northeast region has become compromised for Atlantic City. The Foxwoods (Connecticut), the Mohegan Suns (Connecticut and Pennsylvania) the Turning Stones (central New York) and the Empire Citys (suburban NYC) of this world have siphoned off a great deal of Atlantic City’s customers. Atlantic City is dying. Casino revenue fell below $3 billion in 2013 according to the New Jersey Division of Gaming Enforcement, the seventh consecutive year of decreasing gambling revenue for AC and the first time in 22 years the total has dipped below $3 billion. The city two years ago launched a $20 million advertising campaign with the tagline “Do AC.” But the ad blitz was concentrated mainly in the northeast I-95 corridor of Washington to Philadelphia to New York. Atlantic City needs to think more broadly and this plan to lure more airlines to Atlantic City International is a great start. Believe it or not, AC has some things that Las Vegas doesn’t. A beautiful beach. Cape May, with all its Victorian elegance intact, is a half-hour south. Philadelphia, cradle of independence, is less than an hour away. New York City is two hours away by car, the nation’s capital is three hours away. Instead of marketing to the people of D.C., Philly and NYC, how about marketing elsewhere about D.C., Philly and NYC as part of the greater Atlantic City experience? Right now, the only major carriers flying into and out of AC International are United and Spirit. Imagine if a JetBlue started a flight to Atlantic City out of its Boston hub? Or American out of Chicago to compete with United, or out of US Airways’ hub in Charlotte? There has to be a carrier out there willing to take a bite on the incentives being offered by the Casino Redevelopment Investment Authority. Adding new routes is traditionally risky, especially to such a seasonal place as Atlantic City. It’s a beach town, and while it offers cheap hotel rooms in the winter, so does Las Vegas. And Vegas’ climate is better year-round and it offers far better entertainment options. Still, AC still draws its fair share of convention business. It goes hand-in-hand – if the business traveler is there, the airlines might bite. Right now, it might be the only thing that can save Atlantic City.